This NBBD website was begun when the SER HQ was in Titusville. The East Central Region is located in St. Augustine, hosted by Flagler College and serves Brevard, Indian River, Martin, Okeechobee, Orange, Osceola, Seminole and St. Lucie counties. 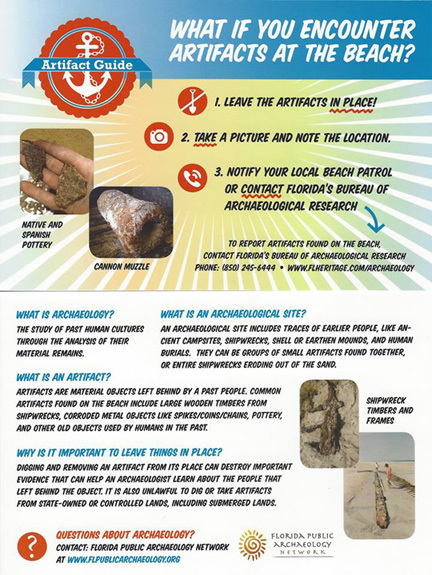 Download a copy of our "Discover Archaeology" map featuring sites open to the public on the Space and Treasure Coasts. Florida is one of the most interesting states in our country. Humans wandered onto the peninsula over 12,000 years ago, exploiting the abundant natural resources that, to this day, draw people from all over the world. That lengthy human occupation has left behind a wealth of evidence; evidence that is quickly being destroyed by the influx of residents, tourists, and development into the region. It is this clash of the past with the present that necessitated the development of the Florida Public Archaeology Network (FPAN). FPAN is a state-wide network of professional archaeologists whose primary mission is to educate the public about the importance of archaeological resources within our state. Kevin Gidusko serves as Outreach Coordinator, bringing archaeology into the classroom and providing training for area teachers. In 1982, during construction of a housing development in Titusville, Florida, a skull was discovered during the de-mucking of a small pond. That skull would set in motion events leading to one of the most important archaeological sites in North America, Windover (8BR246). Excavations commenced in 1984, under the direction of Dr. Doran and Dr. David Dickle, and lasted for three field seasons. Their work produced some of the most astounding finds in American archaeology. One hundred and sixty-eight well-preserved skeletons were excavated from the base of what would turn out to be a mortuary pond - a small pond used for the interment of the dead. What was even more amazing than the number and condition of the remains was their age: radiocarbon dating placed the burials at over 7,000 years ago, making Windover one of the largest, oldest, and best preserved cemeteries in the Americas. These sophisticated burials contained a wealth of information about Native Americans living in Florida 7,000 years ago. The bodies were carefully wrapped in hand-woven textiles made from palm fiber and many of the burials had associated grave goods. These goods included tools and utensils made from bone, antler, and wood; articles of adornment, such as shells; and weaponry that included atlatl weights and stone points. Most astounding of all - 91 of the crania contained preserved brain matter. The Windover site continues to offer clues to ancient life in Florida. The DNA extracted from the bones revealed ancient links to Asia. The textiles are some of the most ancient in North America and speak to the sophistication of their culture. The well-preserved remains have provided information about health and nutrition. My research has examined rates of trauma and arthritis; various forms of dental disease; incidence of infection and congenital abnormalities; and signs of nutritional stress. These studies reveal a people challenged on many levels. Not only were they living among the harsh environs of ancient Florida, with all its associated risks (mosquitos, heat, and gators! ), but they were able to survive serious biological insults. Signs of long-term illness and injury provide clues to their social structure, for individuals who were sick or maimed were cared for, not abandoned. Some, like the young boy with spina bifida, had a multitude of health issues, yet was nursed along for almost eighteen years until he finally succumbed. Windover represents the extent to which archaeological sites speak of the past. These sites hold clues and information about a world vastly different from our own and only through their protection can we continue to learn about the ancient inhabitants of our state.